Works with any template, pattern or jig. Our 11-piece template guide kit will work with any template, pattern or jig for perfect duplicate routing. Ideal for stair, pattern and hinge routing, dovetailing and craft/hobby work. 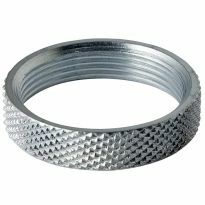 Fits any base with a 1-1/4" diameter center hole. Also available from Rockler, the Guide Bushing Router Plate (sold separately). Affordably priced and designed with maximum utility in mind, this router plate features a 1-1/4" center opening to accept guide bushings and a ring of external mounting holes which forms multiple patterns to allow attachment to most popular routers. Six additional holes are dispersed evenly around the center to provide an escape for routing debris. Did exactly what I wanted. "Porter Cable type" fit my DeWalt compact router perfectly. What's not to like?? This is a tool that I use infrequently but when needed it is great to have. It was handy for making sliding dovetails on bookcase shelves. Another use was to allow me to pre-cut a small slot before using a dovetail bit; this cuts down wear and tear on bits. Good product, nice quality, priced right. They fir my router very well and are well made. Have used several times and experienced no problems. the kit is first rate quality. the case is a good to insure all pieces stay together. knowledgeable and prompt replies with links to purchase. would and have purchased from them again. The Rockler bushings are a quality product and I like the fact they are brass if for some reason something would come loose to keep from damaging my bit. I also like the fact they came with a storage case for safe keeping, seems like more and more products are lacking this lately. While my router came with a centering come, it is more for the router baseplate (which you want to center first before adding the bushing) so the fact the bushing kit came with one for each arbor size was great as they are specifically sized for the bushings. I had several deep cuts to make and even with the vibrations of the router the bushing stayed tight to the base. These bushings fit perfectly into the baseplate if my DeWalt DW618 2.25 hp router without any alterations. I have been working with wood for about 57 years and these are the best router bushings I have come across. 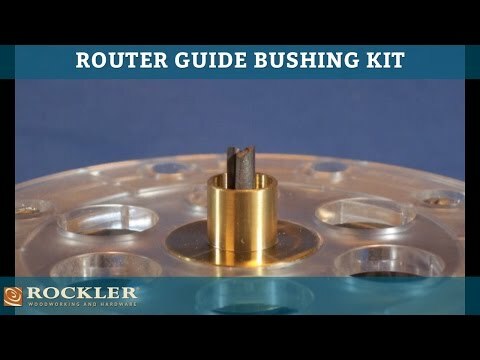 THE BEST ROUTER BUSHING GUIDE KIT I HAVE FOUND !! 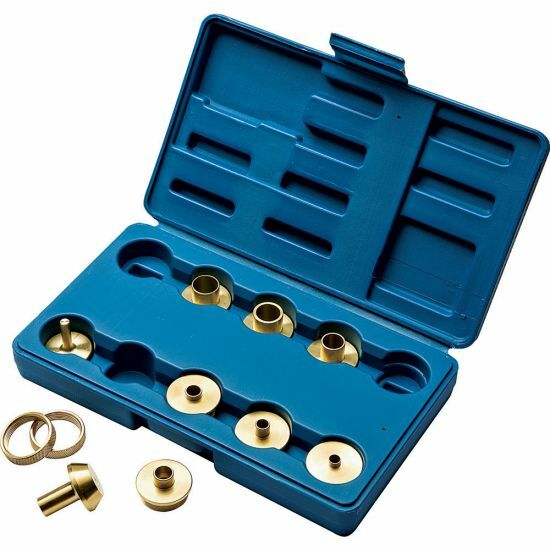 Rockler's router bushing guide kit is the right one for all of your finest router work. It is simple to attach and center on your router and insures that your efforts will be rewarded with a beautiful finished master piece. There is no slippage or wandering of the bushing as I have had with other bushing kits. This kit is now my mainstay for my router work. Quality product. Fit my dewalt plunge router perfectly. Just need to find out all it can do. Multiple collars fit a wide selection of router bits. Just what I needed. Thanks for your quick response. 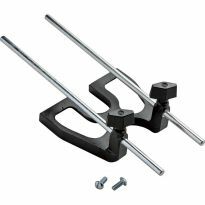 If you have a router base that accepts these they are a great product straight out of the box. Good quality, easy to use and works as advertised! I needed the guide bushings for my Festool router and wanted bushings that were high quality and easy to use with that tool. This kit fit my needs perfectly. Easy to use and has everything needed to attach and center the bushings. Have used the kit several times already and it works great. Would definitely recommend this kit. I have not used it you but it has everything I need. The centering bit will be a big help. It's a must for making sing take all the work out of setting up an spacing . Replaces my old ones. Work just fine with all of my routers. I already owned a brand name set of Guide Bushings that have served me will for years. I now have a Template guided Inlay job to do. The task requires very accurate sizing of the Bushings. Specifically the 5/8" OD bushing needs to be 0.625" to 0.627" or the inlay will not fit properly. My other set's 5/8" OD bushing is 0.620". I'm glad I checked because using this undersized bushing would have ruined the project. The Rockler set's 5/8" OD bushing is 0.6251", that's pretty close I think. I checked the dimensions of other bushings in the set and found similar accuracy on all of them both Inside and Outside. The brass material the bushings are made from, I expect will last my lifetime. The Centering Pins are a wonderful bonus. The storage case is sturdy and well fitted. And the best part is that the Rockler set cost less than the name brand set by over 30%. Thanks Rockler you saved my project. The price was the best I have seen anywhere. The bushing worked perfectly right out of the box. This bushing kit is a very well made set. They will not fit my new Black and Decker plung router RP 250 so i will have to get another new router to use them but you can never have to many tools. Just received the set today and have only checked to make sure it fit my DeWalter router. Appears to be an excellent set of bushings and center guides for both 1/4&quot; and 1/2&quot;. Seems to be excellent product and a great deal, especially at the 50% sale price and free 2-day shipping! Go Rockler!! Very pleased with the set, but I had to cut down the collars on a couple of bushings as they were too long to use with 1/4 inch patterns. I have never liked the bushing system on my Bosch routers. Even when the holder was tight the bushings seemed to move around. The Rockler guide bushing fit the adapter bushings well and were rock solid when everything was tightened up. The guide bushings are exactly as advertised. I love the centering guides which make the task very easy and accurate. I experimented with the bushings to see if I could make an inlay as well as cut the hole. I am delighted with the result. The inlay was a perfect fit. Had an opportunity last week to use these guide bushings with my Porter Cable 690 router. I was working on a special project that needed slots in 3/4 inch plywood and required precise alignment. These guide bushings made the job a piece of cake (figuratively speaking). One template required a 1/2 inch platform and the guide bushing I wanted to use was deeper than that. This meant that the bushing needed to be altered slightly and being made from solid brass also meant it was fast and easy to accomplish. Can you tell that I am very pleased with this product? Exactly as advertised. Centering guides are helpful. Would recommend. Haven't had a chance to use the product yet. Doesn't fit my Bosch 1617evs router, but the bushings are well made. Very satisfied. High quality materials/machining and pirce make this set an absolute bargain!! Recommend to all. Mainly purchased router bushing set for my sign making template set. Worked like a champ. The sale price made it even better. The bushing set was purchased on sale and made it a great buy! Quality is very good. Couldn't beat it with a stick! Great product at a great price. Keep up the good work. This bushing set is a great buy! Very well made! Should last my lifetime! I opened the box and inspected the bushing set, all brass and good machine finish, comes with two alignment tools and an assortment of bushings. I have not used it yet but they are ready for when I need them. I purchased them when they were on sale, a great value! Got this on sale. High quality product, nice fit and finish. Nice case comes with it too. GREAT value. Best value I've seen for this product. The router guides worked great with a good price. Having them come with a case is excellent as long as you close the lid before you use your router. Worked very well, For the price it exceeded my expectations. This set's fit and finish far exceeded my expectations. The threads were finely machined. The pieces easily threaded onto my router. I had previously purchased a set similar to these but was disappointed in them. I would recommend these to others including those who may have purchased cast or machined stamped bushings. Great Value! I've already put it to use. I like the case. Fit my DW618pk perfectly. High quality parts. Case is a big plus. I used the set to cut out a plaque from 1&quot; walnut onwhich to mount a large shield, sporting the logo ofan armored car company, now defunct. Worked like acharm, and I couldn't be more pleased. Good quality, good price. Does not come with collars for the bushings to more easily set up inlays. This is a nice set of bushings at a good price on sale. It would be better if it came with collars for the bushings to more easily set up inlays. It's very good quality and has a good selection of bushings. They work as described. The threaded insert on the router side is a bit tough to unscrew when removing, but otherwise a nice addition to my router work. They work just fine, however the length of the shoulders are inconsistent. I had to trim them down in order to use 1/4" templates. Other than that they work fine. A nice feature would be if they would stamp the diameter of the guide on the inside so you would not have to measure them to find the size you are looking for. Use them in my Dewalt 611 and My bosch 1617 with adapter and they work great. I have had to grind a few of them down as they are a bit long for my needs, but that is better than being to short. Husband put on Christmas wish list. Have never owned Guide Bushings and am excited to increase my experience level for use with various templates - will use the 3/4-inch bushing right away with a 1/2-inch straight bit and JessEm router plate template to install my new JessEm Router Lift in my shop-made router table. I need to route a slot for a router station i am building. try out for sign making. I plan to purchase more router templates for signs in the near future. I've been looking at template guide sets for my PC routers for some time. These are the highest rated, most complete set I've found. Good price for what you get. I've purchased Rockler products before. All quality items! I like buying things in sets. added to my router accessories. I currently only have one guide bushing and can see where I may need various size bushings in the future along with having a spare for the one I do have. I have seen how easy they are to use for making templates and such. Can't live without them now. It matched the base I also purchased. I purchased the 4" letter set but now I realize I had to have the bushing kit for the letters and my router. Don't have any or used them. Works with the router I own. Thought it would be useful. Will these guide bushings fit a Triton router ?? How long are the guide bushings that ride along the edges of the templates? Some brands have guides that get longer than 1/4" as the diameter of the bushing increases. This makes using 1/4" material for templates impractical. BEST ANSWER: The larger bushings have a guide hub thicker than 1/4". Plan on 1/2" material for your template. I found this same problem. I cut mine shorter. BEST ANSWER: Yes you should be able to buy them seperatly. Does the mounting provide for EXACT fit inside Dewalt sub base plates? I've just had problems with another brand that fit slightly loosely in the base plate hole which made it impossible to get repeatable results for close tolerance work. BEST ANSWER: Yes. I have a set of these bushings and they fit both of my DeWalt routers. Thanks Mark. I’ve found after 40+ years of doing this kind of work that a router centering mandrel is to center the baseplate to the router collet. When the buching fits loosely in the baseplate, all bets are off since it tends to shift around during use. Does this kit work for Craftsman 1/2 inch shank router? BEST ANSWER: It's less about the router as it is the router base plate. This will fit in any router base which has a standard template guide opening. It has a 1/2 inch centering cone that will work with any router. The rest of the bushings need a 1-3/16 inch hole in the base plate. I am inlaying tapered legs with both 1/8" and 1/16th router bits. What are the smallest guides that you sell? If you do not have any that would support this application can you suggest and guides which could be used with my Bosch Colt router? Does the bushing locking ring have a locking set screw to prevent the ring from vibrating loose while your are running the router around the pattern? If not, how can you get the ring tight enough with only your fingers? BEST ANSWER: I just get them finger tight and haven had any problems. I do take the base plate off the router to install the bushing and this allows me easy access to get the locking ring tight. With the plate off you could get a small slip lock (Channel Lock) type of pliers to get it tighter if you wanted to. There is no setscrew, but the threads are very fine and I have had no problem with it loosening. Will this work with Makita routers? BEST ANSWER: I am using this kit with a Makita router yes...it will work...as others have said...as long as you have a base plate with a 1 3/16ths diameter hole in it. Do these fit the standard Porter Cable style sub bases? Does this set work with a Festool OF-1400 router? BEST ANSWER: Yes, it fits perfectly in the guide bushing adapter included with the OF-1400. I don't know the Festool OF-1400 so I can say if it would fit, sorry I can't be more help. Does this bushing guide work with the Rockler Jig It Hinge system? BEST ANSWER: Sorry have not use the jig yet so I can't say for sure. Will these fit a Ridgid R29302 and/or Dewalt DWP611? BEST ANSWER: You will need to use the base plate designed for the bushing kit, then they should fit either router. I HAVE A DEWALT THAT THEY WORK ON, I DO NOT KNOW IF THE RIDGIT HAS THE SAME SIZE HOLE OR NOT. are the sizes of the bushings marked on the Bushings or on the storage box?? BEST ANSWER: They are marked on neither, but I always double check with my dial caliper before using them any way. No. There ore no markings on the bushings or the box. would they fit my porter cable 895? will this kit work on a Mikita model 3601B? Will this work with Porter Cable 890 series Routers? I just got the PK895PK. BEST ANSWER: Yes, if you purchase the adapter. I have been using mine for many years and have been happy with the quality of this product. Do these fit a Bosch Colt PR20EVSK router? Will this work with the DeWalt 621 Type 1 plunge router? 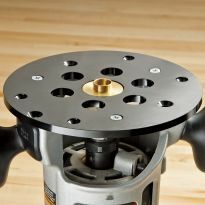 BEST ANSWER: I have DeWalt trim router and I haven't used it with that router. My plunge router is a Porter Cable and it works fine with that. 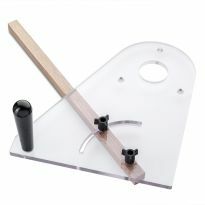 Based on my experience with Rockler I'd buy it and if you are not satisfied they'll do whatever to resolve your problem. Will the 1/4 ID, 5/16 OD bushing work with the Rockler interlock lettering kit? Or is it too long? 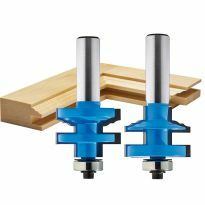 Will these fit the dremel plunge router base? BEST ANSWER: No they will notEnter an answer to this question. will the #59031 bushing kit fir a Porter Cable #6911 base? 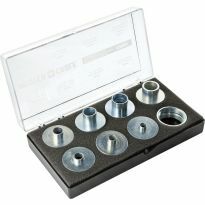 will rockler router guide bushing kit #59031 work with a craftsman plunge router model #27666 ? BEST ANSWER: Well I am sorry I have not used this product yet. When I purchased it I planned to use it shortly, however things changed. At this point I do not know when I will get a chance. Will this set of bushing fit my Bosch MRF23EVS fix based router? Will this work with the Triton TRA001? BEST ANSWER: Probably, It's less about the router as it is the router base plate. This will fit in any router base which has a standard template guide opening. So you may need to bu a new Base Plate. Does this kit work with the Festool 1400 router? BEST ANSWER: I do not know. I use the one I bought with a Bosch. BEST ANSWER: Yes, it does contain the size required for the Jig-It system. I need a 42040 Porter cable template guide to use with my dovetail jig. What would be a substitute for it? BEST ANSWER: I bought the Router Guide Bushing Kit from Rockler and it has become one of my most essential accessories. I love the handy case. It stores right on the shelf beside my router table. It's a must have for any woodworking shop. Will these fit into the Dewalt 611 plunge router? Will these work with a Rockwell 5008 dovetail templer?